Bletted Medlars showing the formation of the seed capsule inside the fruit. It seems rather odd to have come back to writing this blog; still feel rather dissociated from it. Anyway, it's medlar time of year again and in previous years I've made jelly and last year medlar and japanese quince jam. I wanted a change. We love the jelly but there's a limit to how many jars of sweet stuff a small family can consume in a year. One recipe I've kept in my favourites for some time is this one, Theodore Garrett's Medlar Cheese, recorded by Historic Food. I really wanted to make those divine little moulded shapes but I don't have any moulds which rather inhibits that plan. I did have perfectly bletted medlars so I decided to give it a go and set the paste in tiny dipping sauce bowls and espresso cups. 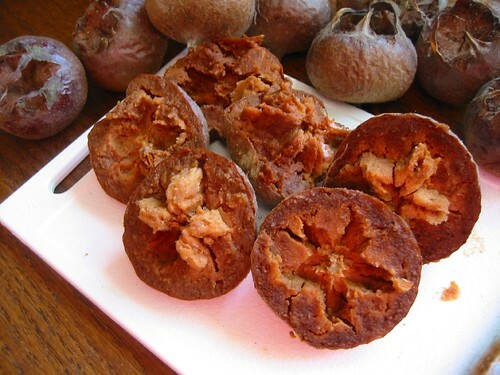 Bletting (or bringing to a point of rotteness) medlars is pretty easy but you want them to mature without becoming infected with fungal colonies or mildews, so it helps to have them in an airy place during the process so that nothing too noxious can start to grow. I had mine for two weeks in an unglazed earthenware dish on the cool side of the kitchen and it worked beautifully. I decided to follow the recipe exactly as this was a first for me, I've never actually made fruit cheeses or pastes before. Immediately I got stuck because of a lack of equipment. The fruit is supposed to be softened in a jar heated in a pan of simmering water. I don't have a suitable jar/pan combination. After some thought it seemed possible to substitute for this by using a covered glass casserole in a baking pan of water in the oven (about 150C). This worked well but took over three hours before I felt the fruit was soft enough to sieve. From my 1.3kg medlars (all I could fit in the pan) I took a yield of 840g hard won sieved medlar flesh. I do hate rubbing things through a sieve and would recommend you use a mouli if you have one. After adding the sugar (375g sugar to 500g medlar pulp) the mixture is supposed to be stirred over the heat until it leaves the sides of the pan clean. I found the paste so thick already that this happened almost immediately and so I suspect I didn't cook it quite long enough. I filled my little cups but after a while setting they showed no signs of firming up enough to slice which would justify them the title of a fruit 'cheese' so I've decided to call it butter. The bulk of the recipe has been potted in jam jars but the scrapings and leftovers have been spread into a shallow tray and returned to the barely warm oven to dry out for a few hours and make fruit jelly sweets. The flavour is lovely, I don't think anything will be wasted. I'd like to give this a go, but don't have access to Medlars, what is the best fruit to buy at the local market in order to try this? Did you get around to making your ginger beer in the end? what an interesting idea! i'm not sure i have the patience to try it but it sounds amazing! as i type this i am listening to a row about cornflakes between my son who thinks they are a good snack and his father who thinks they are rubbish. it is quite surreal. Fuzzlewoof - traditionally Quince is often used for this sort of preparation but I think you'll have just as much trouble finding that locally to you. Cooking apples will work pretty well. You might need to add a small amount of water to the pot while cooking the pulp but on the other hand you won't need to blet them and it should be possible to peel and core them before cooking making the sieving much easier. I think the juice of a lemon added to the mixture would be a good idea too. Ummmmm ginger beer!, is it possible to home make ginger beer with little of no sugar? I feel very ignorant - I've never heard of medlars before. I suspect that they aren't common over here in the U.S. Sounds like something I'd try at least once too. I'm glad you've done some more posts. I hated sieving things until I got a different type of sieve. It is cone shaped metal with perforations in the sides, and you can therefore not rub, but plunge or use a spoon or spatula to press things against the sides. Much easier to wash up thoroughly too. I use no other kind for jam-making now. I have made apple butter and apple cheese for a long time now. Need to be kept airtight, and fridged once open, but tasty. Flavour with cinnamon, or ginger, or allspice, to taste.